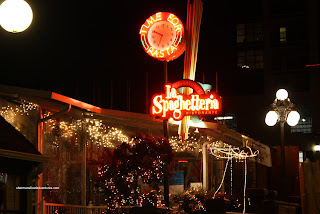 For as long as I can remember, La Spaghetteria has been in the Entertainment book. Every year, I would tear out the coupon in hopes of trying it out. That hope has lasted for 15+ long years. For some reason or another, I just never got around to it. In the meantime, I would go practically everywhere else for pasta other than La Spaghetteria. And it's not like I didn't have access to it either. I used to live in Coquitlam and that wasn't too far away. Now I live in Burnaby and New West is not really that much of a drive either. Finally, the time has come. Well, if it weren't for Miss Y, my coupon would be in the recycle bin by the time next November hits. You see, it is her birthday and guess where I took her? 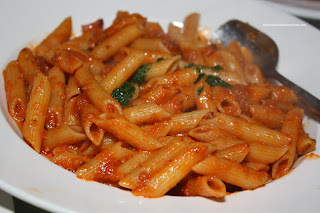 For the as long as I've know her, she has raved about the Penne Arrabiata here. So much so, she even liked it more than the one from Q4. Now that is a bold claim. What is more shocking is that she raves about a dish that a particular restaurant is known for. Normally, she'd do the unthinkable, like order a lasagne from a Japanese restaurant. Wait... I did that... You know what? She's right about the penne. It is better than the one we had at Q4. Perfectly al dente penne with just the right amount of sauce, I thought this was the best pasta of the meal. The sauce was tomatoey with just the right amount of spice. Nicely done. 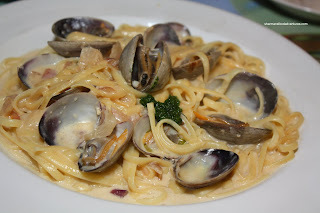 If the penne arrabiata is her favourite, then Linguine alla Vongole is mine. To change things up a bit, I went for the cream sauce rather than my usual preference of tomato. I have to say that this one was not really my favourite. The pasta was overdone and the cream sauce was not very flavourful. Not much in the way of clam flavour or anything else. For a recent comparison, I would say the one from Jimoco was better. As if 2 pastas weren't enough, we got an order of the Gnocchi in meat sauce as well. 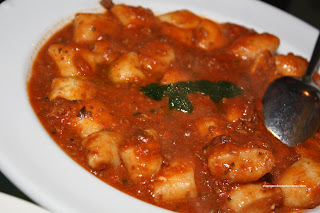 From the picture, I'm sure you'll notice the gnocchi are absolutely huge. Despite this, they were very fluffy. In fact, probably too fluffy. For me, it lacked any real texture. With that being said, I'd much prefer soft than too chewy. I did like the meat sauce though, it was slightly tart with a good balance of sweet and savoury. It went well with the gnocchi. While we were ordering the gnocchi, Miss Y remarked that there was not a whole lot of meat in any of the pastas. It's like we read each others' mind since we both agreed on sharing some Meatballs as well. I mean, we ate some meatballs... er... uh... whatever... 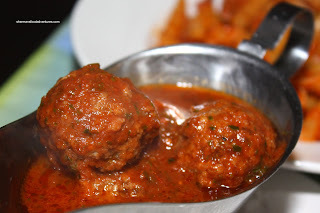 Nothing wrong with these meatballs. They were meaty while still being moist. A good combination of garlic and herbs provided the flavour with the slightly tart tomato sauce balancing it out. Although we had ordered way too much food for 2 people, I had a yearning for pizza. I thought we needed to try it just to make sure. So we did! We gave the Pizza Margherita a go and I wish we hadn't. Not a terrible pizza by any stretch of the imagination; but it wasn't a Pizza Margherita. 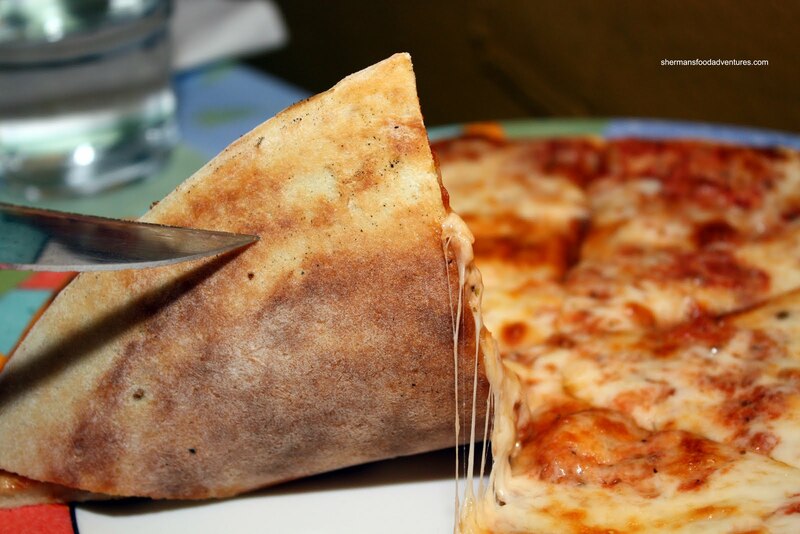 The lack of fresh basil and the use of regular mozzarella was enough to show it was just a "pizza". I found the crust a bit doughy and too soft. There was a good amount of cheese; but little else in terms of flavour. Best to stick with the pastas... And about those pastas, I would say it is a bit of hit and miss. Overall, it ain't bad and I would probably go back to try some of the other offerings. The Entertainment coupon helps temper the slightly high prices. With that being said, the pastas are around the same price as Boston Pizza and gawd, this is better than BP. "Every year, I would tear out the coupon in hopes of trying it out. That hope has lasted for 15+ long years"
Wow ! You are one patient man, Sherman. Is this the place next door to the Old Bavaria Haus ? I admit I have been curious about them, but for some strange reason everytime I think of "pasta" + "New Westminster" I associate with The Old Spaghetti Factory [shudders]. I know, not fair. Well good to know Spaghetteria is actually worth checking out. I'll keep them in my back pocket. I often wonder if you ever return the food to the cook if it was not done right? Anson, I rarely return the food. I just like eating it as is. My wife however will return it.